I had a plan. I was going to go to the grocery store, get stuff, and then attempt Moroccan food because I’m developing a taste for putting cinnamon in savory dishes. Then, it had to rain for 36 hours, before unexpectedly turning into snow – serious snow. On some level, I blame myself. I’ve been listening to “Let it Go” from Frozen obsessively, and clearly my (and everyone else’s) obsession with that song has given Mother Nature ideas. Sigh. However, part of the point of this whole blog is to teach myself to make delicious meals even when this sort of thing happens. So I switched to bossa nova music and checked my annoyingly empty fridge to come up with something. My conclusion: gnocchi! So yes, this is the third gnocchi recipe on this blog, but it is also by far the simplest. Take one large purple-skinned yam, and cut it in half. The type is actually important, as these are only slightly sweet, but much starchier than regular potatoes. Roast half the yam in the oven at 400 until soft, about 40 minutes. Roasting is also important because it dries out the yam better. Once the yam is tender, peel off the skin and scoop the insides into a bowl, mashing and breaking it apart as you go. Add the flour, and mix it into the yam. Then form the mix into little ovoids, like any gnocchi. And that’s it. They are done and ready to be consumed. Warning: do not try boiling them – they will disintegrate. Melt about a tablespoon of butter into a saute pan, and cook the onion and garlic at a fairly high heat until they start to brown. Remove from heat, and add the gnocchi to the pan, and toss them with the butter/garlic/onion. Serve warm. 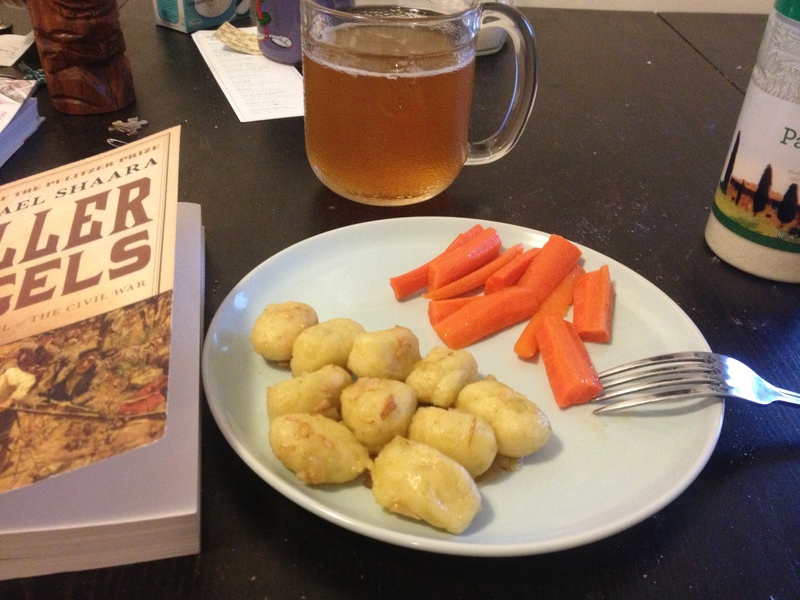 Gnocchi, carrots, novel on the Battle of Gettysburg, and my nifty new beer mug! Seriously yummy dinner. Slightly sweet, but not intensely so. A bit on the starchy side though, enough so that I was pondering adding some balsamic vinegar to the sauce to make it all a little less so. You can also add parmesan, but I found it unnecessary. But nevertheless, an excellent dish made with only 5 ingredients. It is very very filling. Like super filling. As you can see from the picture, I served this with beer. It should have probably been served with a solid red wine (which, naturally, I was out of) like a Cotes du Rhone or a Shiraz. It is solid and sweet enough that red would balance out better then white. Finally, the song of the week was going to be “Let it Go,” but instead I’ll go with the Pentatonix cover of “Happy,” because it really does make me happy. Sorry about the prolonged absence. Sometimes life gets away from me. 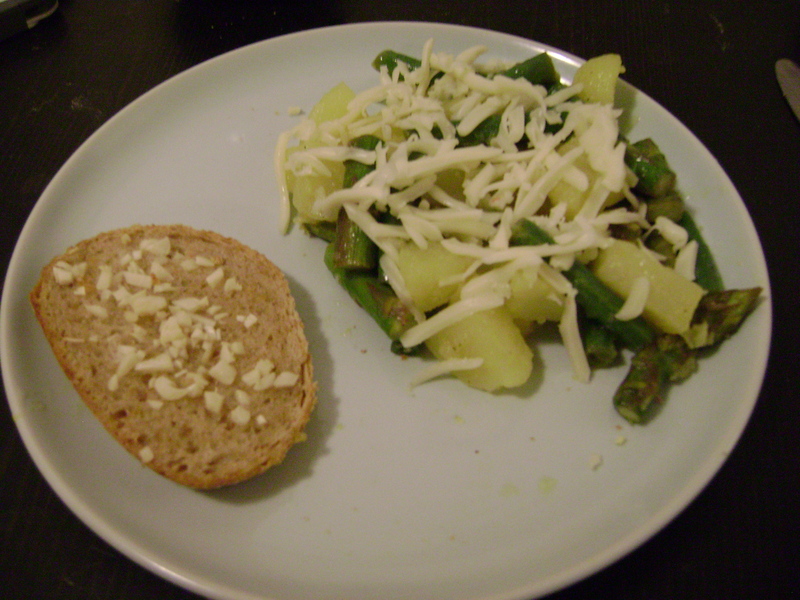 It is spring again, and you know what that means … asparagus! Yes, this is another asparagus and lemon recipe, but it’s completely different from last year’s concoctions. This is actually a spring vegetable salad, inspired by a Green’s recipe and brought to fruition by half-forgotten 1am musings and a subsequent conversation with my dad. It is a spring potato salad, which quickly became ironic because the day I made it there was yet another snow storm out here. Before I get into the recipe, I want to make one thing very clear: mayonnaise is gross. Sticking it into a potato salad is just icky and if that is the kind of thing you enjoy or are looking for, then stop reading now because this is completely different. Chop the asparagus, toss with olive oil, and roast in the oven at 400 degrees until tender. Boil the potatoes until they are soft, and chop them into chunks. Wait until they have cooled a little bit, but they should still be warm. Take the green beans and parboil them, just for a few minutes. You can cook them all the way if you prefer, but I like green beans a bit more on the crunchy side. While the vegetables are cooking, make the lemon vinaigrette. Put all the ingredients, except the oil into a small bowl and whisk together. Once those have been combined, add the olive oil, whisk, and set aside. Once all the vegetables have been cooked, stick them all in a bowl and toss with the vinaigrette. Stick in the fridge to cool. Right before serving, grate the fontina cheese and add it to the salad. This salad is so yummy! The lemon is an important touch, add cooling the salad really allows the flavors to blend and seep in. I had the salad with garlic bread, and a glass of red wine because that’s what I had open, but you should really have it with white wine. When in doubt, pair lemon/asparagus dishes with white wine. Also, this salad keeps really well. If anything, the potatoes taste even better the next day, so don’t be afraid to make a big recipe and save the leftover for lunches. Song of the week, not precisely a song per se, but the joys of #mcconnelling. This and this are two of my favs, but there are countless others, and they are all funny. Somehow, it never stops being funny. Mardi gras is one of the best holidays ever invented. It is literally a license to drink and eat foods that are bad for you. Technically after this lovely indulgence comes Lent and deprivation as Christ also suffered and was tempted in the wilderness. But the beauty of being an atheist is that I get to pick and chose what traditions I follow! 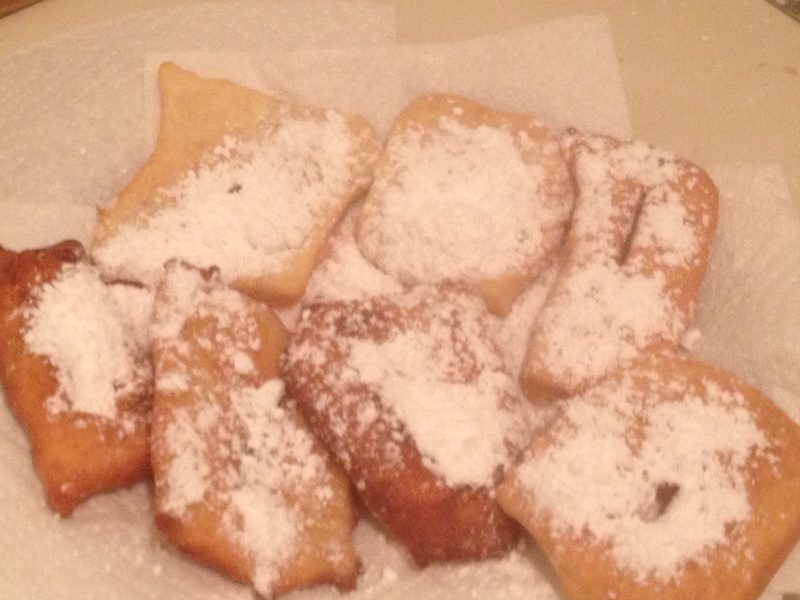 Also, as luck would have it, NPR did a food blog on different kind of donuts for Mardi Gras. Since I was not about to attempt to make beignets, I made an Italian sort of donut: cenci. Blend together the butter, sugar, and egg with an electric mixer. Once mixed, add the lemon zest, flour, and white wine or water. I used a light vinho verde. Once all the ingredients are mixed together, the dough will be stiff, but sticky (it sounds strange, but it is). Refrigerate the dough for at least one hour. Once the dough has sufficiently chilled roll it out, and cut it into strips or squares. Mine were more like squares. Cut a slit in the middle of each one. Then fry them in vegetable oil. I don’t deep fry things. Instead, I poured about an inch of vegetable oil into a frying pan, and put the heat on high. Once the underside and the edges started to brown, flip them over and cook a few more minutes. Place them on a plate covered it paper towels to soak up the excess oil. Sprinkle with lots of powdered sugar while the donuts are still warm and eat! These were soooo delicious. I liked the lemon zest in particular, it made for a lemony flavor, which is unusual with donuts. Also, the dough wasn’t particularly sweet, so it wasn’t overpowering when you add the sugar. I’m curious if they would taste good with lemon curd instead of powdered sugar, but I’ll have to wait a long time before I can try those. Now, I tried these first with a glass of the wine I cooked with, but that was a bad choice – they did not mix well. Far better tasting with a cup of tea or a glass of milk. Since it was mardi gras, I had to listen to zydeco, in particular Iko Iko (this is not my favorite version, but sometimes you have to make do).